I know it may not look like it, but this lady pulled out in front of me and I almost hit her. This is what the super-wide angle of 15mm will do to an image – it expands the space and makes things look so much further away. I was testing out the new car mount that I got for my GoPro since I’d been having issues with the suction cup losing it’s suction (it’s a first generation suction cup mount). The new mount is a heavy-duty magnet that is rated up to 100 mph. So far so good – and a lot easier to set up. I’ve seen this back home in Winchester and I’ve seen lots of discussion threads because of it out here in CA. Still can’t find a solid reason for it. 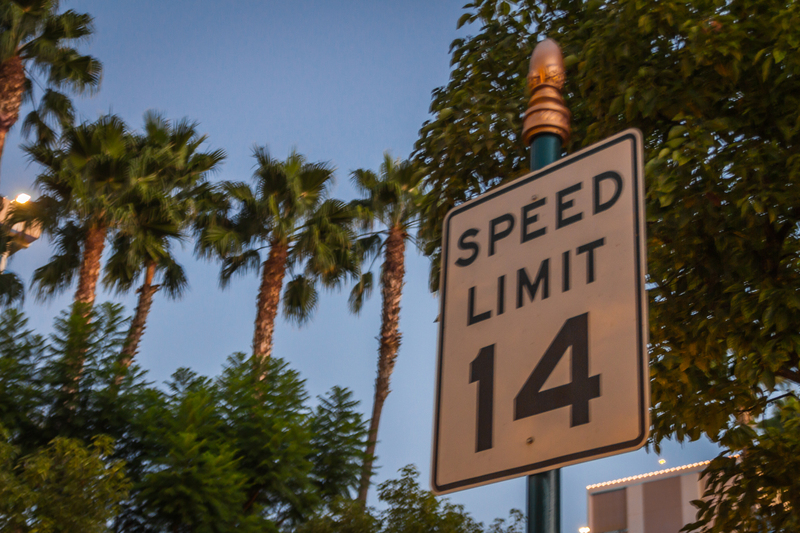 Why a 14 mph speed limit? And so on and so on and so on. I tend to fall into the reason #1 group, but I like them all. After 18 hours, 4 and 1/2 states and only three Red Bulls, the vacation really begins. We chose to drive straight through and I’m kinda glad we did it that way. It may not be so easy on the way home though. My view for most of the day. With an 18-hour day, this is about the extent of my shooting today.